Thailand will be extending their Visa on Arrival Fee Waiver for tourists from 21 countries and regions, including China, India who can enjoy the visa-on-arrival fee exemption until late April this year. The cabinet approved a proposal to waive VOA fees from January 13th to April 30th 2019 in a bid to attract foreign tourists during Chinese New Year and the popular Songkran Festival. 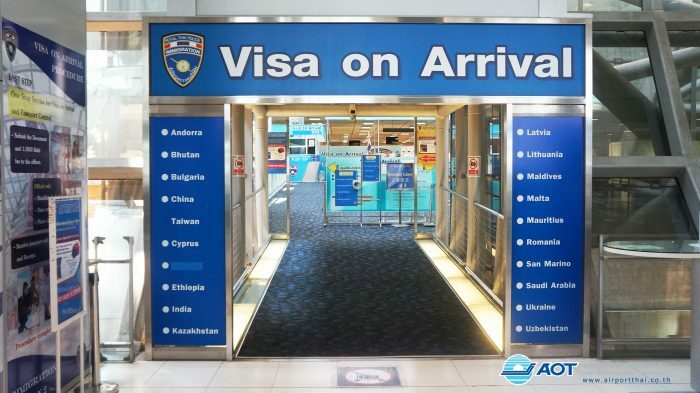 The current promotion of waived Visa on Arrival fees in an attempt to drive tourism started on 15 November, 2018, and was supposed to end on the 13th of January, 2019 but the promotion was obviously successful which prompted politicians and Tourism officials to initiate an extension of the campaign until the end of April 2019. From 15 November, 2018, to 13 January, 2019, citizens of Andora, Bulgaria, Bhutan, China including Taiwan, Cyprus, Ethiopia, Fiji, India, Kazakhstan, Latvia, Lithuania, Maldives, Malta, Mauritius, Papua New Guinea, Romania, San Marino, Saudi Arabia, Ukraine and Uzbekistan will be exempted from the 2,000 Baht visa-on-arrival fee for the purpose of touring in Thailand not more than 15 days. According to information from Xinhua News Agency (access here) the Thai Government has decided to extend the campaign until April 30th 2019. “We continue the visa-on-arrival fee exemption to attract more tourists to visit Thailand during the festivals to be celebrated in the kingdom, such as the Chinese New Year, and Songkran to boost our tourism continually”, said Thai Minister of Tourism and Sports Weerasak Kowsurat to media on Tuesday. The proposal still has to be released on the Royal Gazette to formally come into effect. Tourists from 21 countries and regions, including China, India and Ethiopia can enjoy the visa-on-arrival fee exemption until late April this year. This will be very popular with tourists especially those from China and India which are the two most prevalent nationalities of tourists eligible for Visa on Arrival. Keep in mind that at Bangkok Airport there is NO ATM in the arrivals area before immigration, only money exchange counters of various banks. You therefore need to bring cash in your home or at least international currency. The counters close to the VOA channel are usually extremely busy so if you indeed need to change money do so in one of the other concourses leading towards the immigration area. It’s great that VOA eligible nationals can continue to enjoy this fee waiver even though the process is still sort of a pain and my friends stood in line for three hours in late December which was absolutely crazy. Hopefully this will be figured out properly so that there aren’t any surprised and people are suddenly asked to pay. In any case I recommend to pay special attention to the fact that there are no ATM’s before immigration so keep cash ready just in case you need to exchange money.